Huge day of news and updates! We stated their would be lots of updates and changes to loyalty programs and credit cards today! We've brought you most of them so far but there it at least one more new offer to come later. The biggest news we would peg as the new Companion Voucher Offers for the WestJet RBC World Elite MasterCard followed by the Aeroplan news of being able to use miles for taxes and fees. All of the news so far have had their own posts here on the blog so you'll find them in the list below! As we mentioned yesterday, the Air France KLM Flying Blue Promo Awards for March came out but then were pulled. Well they are back up and the only Canadian city included is Edmonton. 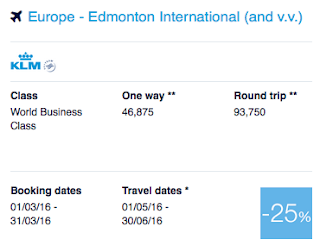 You can save 25% of the normal miles required to fly in KLM World Business Class between Edmonton and Europe. Not like the 50% we saw before Christmas but still if you were planning to redeem soon at least now you can save 25%. Find out more here. Say hello to the updated WestJet RBC World Elite MasterCard - travelling with a companion just got way better!